Obv. : Bust of ruler in three quaters left. Large earrings in his ears. Sogdian legend in left and right fields. Rev. 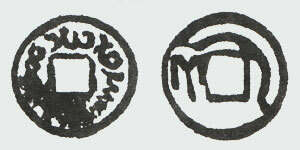 : Turgesh's tamgha in the center in the shape of stylized runic letter am. 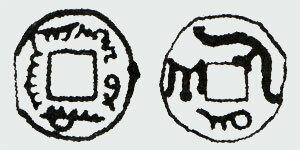 (#54 A.Kamyshev, Early Medieval Monetary Complex of Semirechie, #20). Turgesh's kaganate. 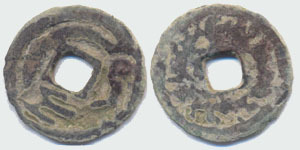 King Vahshutava, 8th century. Obv. 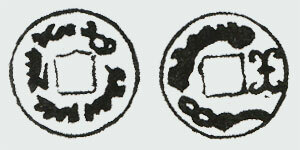 : Sogdian legend xwt' w'xswt'wy pny "coin of king Vahshutava" around square hole. Rev. : Tamgha of Turgeshs. 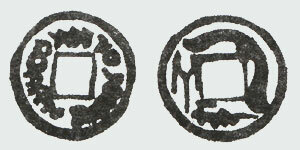 Tamgha in the shape of runic letter p in left field, character yuan in right field. (#54 A.Kamyshev, Early Medieval Monetary Complex of Semirechie, #21). Turgesh's kaganate. First half of 8th century. Obv. : Sogdian legend bgy twrkys g'g'n pny "Fen of king of Turgesh's kagan" around square hole. Rev. : Tamgha of Turgeshs. Runic letter "p" in left field, Sogdian legend (one word: "prn") below. (#54 A.Kamyshev, Early Medieval Monetary Complex of Semirechie, #22). Turgesh's kaganate. Second half of 8th century. Rev. : Tamgha of Turgeshs. 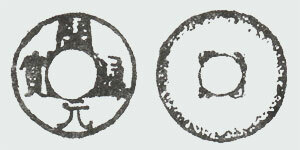 Runic letter "p" in left field, Sogdian legend (one word: "mng") below. (#54 A.Kamyshev, Early Medieval Monetary Complex of Semirechie, #23). Turgesh's kaganate. First half of 8th - till mid'9th century. Rev. 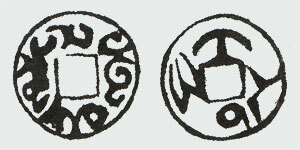 : Tamgha of Turgeshs in the shape of stylized runic letter am. (#54 A.Kamyshev, Early Medieval Monetary Complex of Semirechie, #24). Rev. : Tamgha of Turgeshs. Runic letter "p" in left field. (#54 A.Kamyshev, Early Medieval Monetary Complex of Semirechie, #28). Rev. : Tamgha of Turgeshs. Runic letter "p" with dot in center in left field. 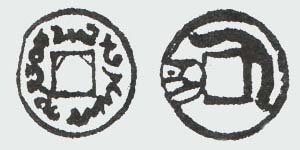 This type of coins has differences in the location of the tamgha in relation to the square hole..
(#54 A.Kamyshev, Early Medieval Monetary Complex of Semirechie, #30). Turgesh's kaganate. 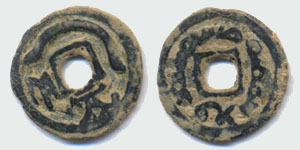 King Inal-Tegin, mid'8th century. Obv. : Sogdian legend 'yn'l tkyn xwbw pny "Fen of king Inal-Tegin" around square hole. (#54 A.Kamyshev, Early Medieval Monetary Complex of Semirechie, #33). Obv. : Distorted Sogdian legend 'yn'l tkyn xwbw pny: "Fen of king Inal-Tegin" around square hole. Rev. : Tamgha of Turgeshs. 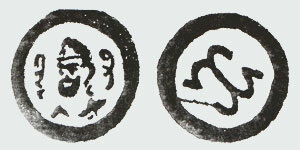 Runic letter "p" in left field, distorted Sogdian legend (one word: "prn") below. (#54 A.Kamyshev, Early Medieval Monetary Complex of Semirechie, #34). Turgesh's kaganate. 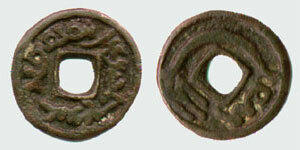 King Hai-Inal-Anir, first half of 8th century A.D. Obv. : Sogdian legend x'y yn'l 'nyr xwbw pny: "Fen of king Hai-Inal-Anir" around square hole. Rev. : Distorted Sogdian legend bgy twrkys g'g'n around square hole. Small tamgha in right field. (#54 A.Kamyshev, Early Medieval Monetary Complex of Semirechie, #35). Obv. 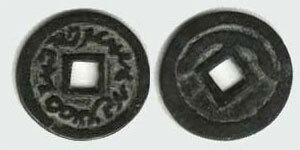 : Sogdian legend xwt'w w'xswt'wy pny "coin of king Vahshutava" around square hole. (#54 A.Kamyshev, Early Medieval Monetary Complex of Semirechie, #36). Turgesh's kaganate. 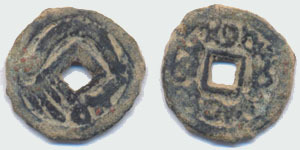 Second half of 8th - early 9th century. Obv. : Sogdian legend around square hole. Rev. : Turgesh's tamgha. Runic letter "p" in left field, Sogdian legend (one word: "prn") below. (#54 A.Kamyshev, Early Medieval Monetary Complex of Semirechie, #37).